I grow Orchids. 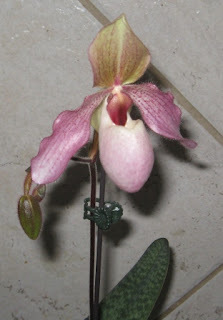 This is one of my special orchids I got a few years back at the Edmonton Orchids Show. I missed the show this year but do have three flowering now and three more coming. Your lady slipper is beautiful Cathy- you have some fascinating interests- I love flowers of all sorts but I do not have a green thumb.